Ever wondered what it’s like to be a marine scientist? Learn about Guam’s coral reefs and how to survey while snorkeling at the beach. Coral reef monitoring is one way marine biologists track reef health by measuring how much coral, algae, and other marine species change over time. If you love to be outside and in the water, this will be a fun service learning project that gives you real field experience in Guam’s marine environment. Students receive hours for training and additional hours for volunteering in future monitoring events. Students under the age of 18 must have their parent/ legal guardian fill out our PADI Liability Release Form. Available here to print and bring signed hard copy to training. Forms also available on site the day of training. Wear appropriate swimwear, sun protection, and closed-toe shoes (tabbies, reef walking shoes, or old tennis shoes). Bring a reusable water bottle. Visit guamreefmonitoring.wordpress.com to learn more about the program or follow us on Facebook at facebook.com/gureefmonitoring. Check out our Media Gallery to see what you’ll be doing. 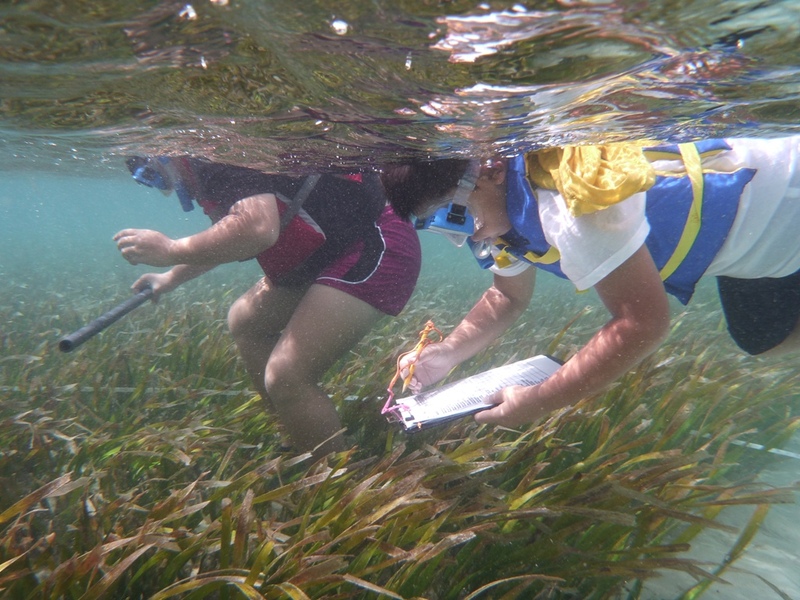 Class training will be held on site for an overview on threats to Guam’s reefs, how people help protect reefs, a water safety briefing, and an introduction to coral reef monitoring surveying methods. Training materials and snorkeling gear are provided to borrow for free. In-water training: Practice coral reef monitoring survey methods using monitoring equipment and other materials. Students are assisted step by step to practice their in-water skills to conduct surveys. Mask & snorkel and life jackets are available for students to use during training and other in-water program activities. A limited number of tabbies/ aqua shoes are available to borrow. Follow instructions for data collection. How do activities on land affect our coral reefs? Support explanations with field observations during your training. How are coral reefs connected to CHamoru culture? Explain. Why is important for people to get involved with caring for our island’s resources? Are Guam residents responsible for caring for our island’s reefs? 2. Create a video, Public Service Announcement, or pamphlet to promote volunteering for Coral Reef Monitoring to share with your school community or village community. Use your experience to inspire your message. Understand the importance of the island’s coral reefs as a natural and cultural resource.